Since 1980, the experts at Matthews Wall Anchor have been providing quality piling, underpinning, and shoring solutions for commercial projects in Delaware. We repair settling foundations, uneven floor slabs, and collapsing retaining walls by using the latest materials and products on the market. Our products are made by Earth Contact Products (ECP), the leading manufacturer in the underpinning industry. Matthews Wall Anchor uses the appropriate structural methods and offers the services of structural contractors and civil engineers to ensure efficiency and productivity. At Matthews Wall Anchor, we can repair new or existing foundations by applying helical piles or augercast piles. Because helical piles have unique design properties, they are used on unstable soil conditions or to avoid excavation expenses. Augercast piles are another piling solution that is designed to support bridges, towers, buildings and much more. Matthews Wall Anchor provides effective underpinning solutions to existing foundations. This process involves transferring the load to the piers. Click here to learn about the many benefits of using underpinning. Matthews Wall Anchor offers shoring solutions for new and existing retaining walls. We use plate anchors to stabilize and support cracking and bowing walls. The installation is a quick process that uses hand-held equipment with little excavation implemented in the work area. Our expert civil engineers will work with you to design the structure you are needing and envisioning. The civil engineers at Matthews Wall Anchor will provide you with a structure that will withstand harsh conditions, help lower heating and cooling costs, and last for years. We have experience with a wide variety of properties, including hotels, office buildings, schools, and more. Contact us to learn more about how a Matthews Wall Anchor engineer can make your structure efficient, convenient, and durable. We also offer soil nailing to permanently or temporary secure retaining walls for commercial businesses and homes. Soil nails can be used in confined areas such as sheds, tunnels, garages, and buildings. 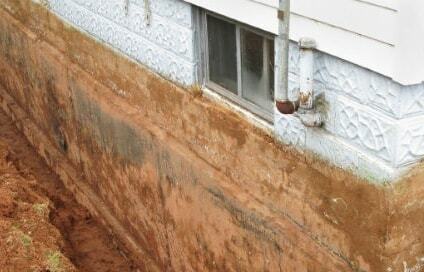 We offer quality products to keep your foundation structurally sound. Contact us today for an estimate.